Elijah Bristow would recognize much of the trail he pioneered across the Cascades and into the southern Willamette Valley, even though it has been 167 years since he made the trek. Bristow was among the first to make his way down what would become Lane County’s Free Emigrant Trail, today’s Highway 58, following Salt Creek and other tributaries of the Willamette River. He settled in the community he named, Pleasant Hill, as the first white settler to stake a claim there in 1846. Sure, there have been some social changes since then, but the terrain remains much the same. It’s still a beautiful tree-lined corridor filled with natural—and a few man-made—wonders along the way. 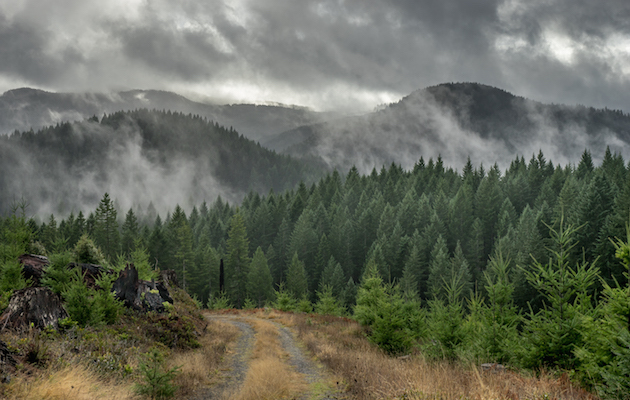 Others followed Bristow on the wagon road that was an alternative to the Barlow Road across the northern Oregon Cascades. Unlike the Barlow, this one did not charge a toll. Hence, the Free Emigrant Trail and today’s Highway 58. 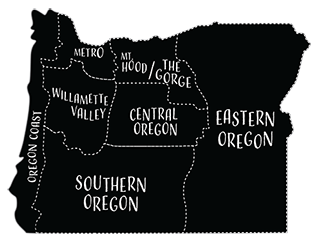 The eastern terminus is at Highway 97 north of Chemult, and the western point is at I-5 in the Willamette Valley. While it comes to an end near the legend-rich university town of Eugene and its neighbor Springfield, there are a few pioneers along the way, in towns such as Oakridge. These are people who have taken up the challenge of making a life where natural resources rule supreme. Back in Bristow’s time, it was logging and lumber, but today you’ll find fishing, skiing, cycling and more. 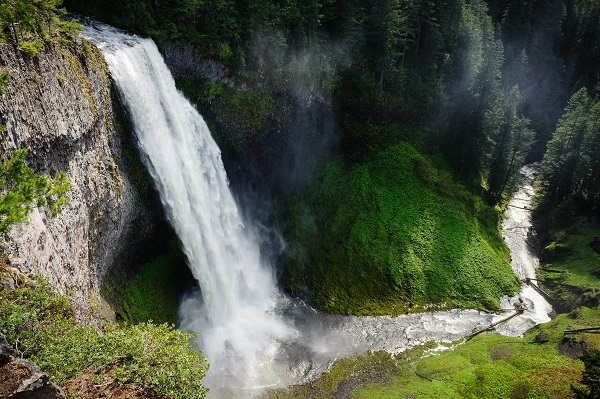 Top to bottom, you’ll cover about 5,000 vertical feet on this drive as it descends from the Deschutes National Forest into the Willamette National Forest, with towns and attractions along the way. 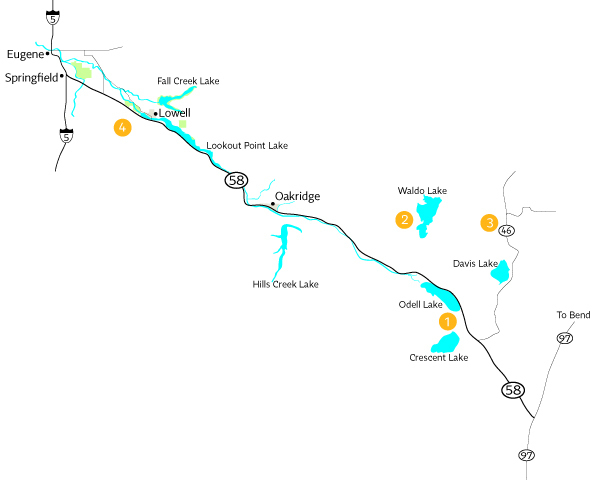 You’ll share the road with a few truckers who use it as an alternative to I-5 but rarely hold up traffic, with passing lanes aplenty.The upper reaches of Highway 58 are dominated by the principal pinnacle, Diamond Peak, and three nearby lakes, Crescent, Odell and Waldo. Here in the high country, winter or summer, folks looking for that outdoor experience can find it here—fishing, hiking, skiing and snowshoeing. 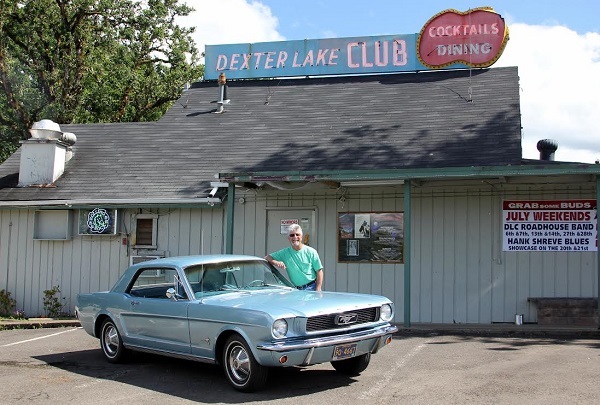 Crescent Lake Junction is something of a pit stop, with a mercantile that caters to snow sports enthusiasts, and the fishing, camping and hunting community. There’s Manley’s Bar, which survived a forest fire in 2000 only because aircraft bombed it with retardant. A few other small shops dot the landscape. The Willamette Pass Inn, cabins for rent and camping comprise the lodging options in the area. Crescent Lake is just off the highway. To the west and downhill is Odell Lake, with its own resorts, east and west. Shelter Cove Resort has a general store, boat ramp and a blanket of tranquility. During winter, the lodge hosts snowshoers, snowmobilers, and cross-country and alpine skiers. On the east side, Odell Lake Lodge can hook you up, so to speak. 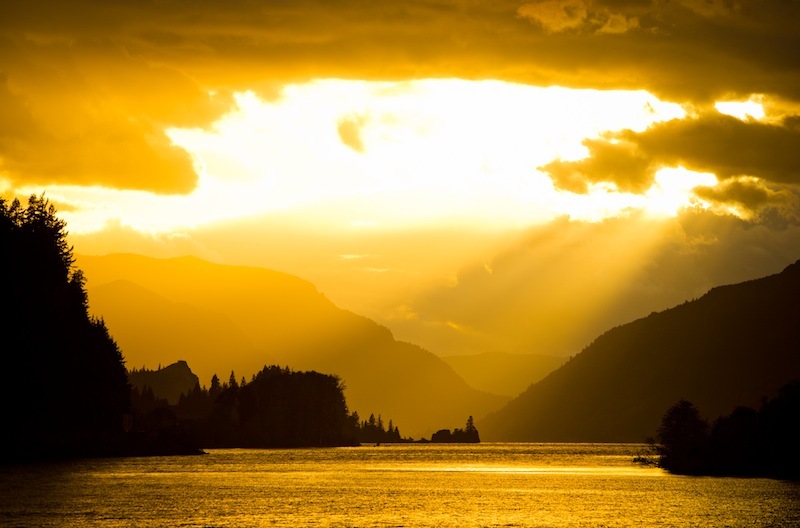 Odell Lake is known for its fishing and holds the world record for largest lake trout caught at 40 pounds in 1984. Both lakes border the Diamond Peak Wilderness, where the headwaters of the Willamette River are found. Just down the road is the Willamette Pass Ski Resort. The pass is Oregon’s Continental Divide. Waters to the east flow into the Deschutes River and waters to the west flow into the Willamette River, marking the divide between the east and west sides of the Cascades. Access to another popular lake—Waldo—is just below the pass. No gasoline-powered motors are allowed here. It’s one of the largest natural lakes in the state and one of the purest, filled with rain and snowmelt and with no inlet. The lake sits on the southern edge of the Waldo Lake Wilderness. If you want solitude in Oregon, this is a good start. The downhill run of Highway 58 steepens. Salt Creek becomes your roadside companion as it churns along the highway. Salt Creek Falls is to the south. A rare treat still lies ahead, through the tunnel and beyond. If you have a moment and are willing to take the plunge, McCredie Hot Springs are just east of Oakridge. 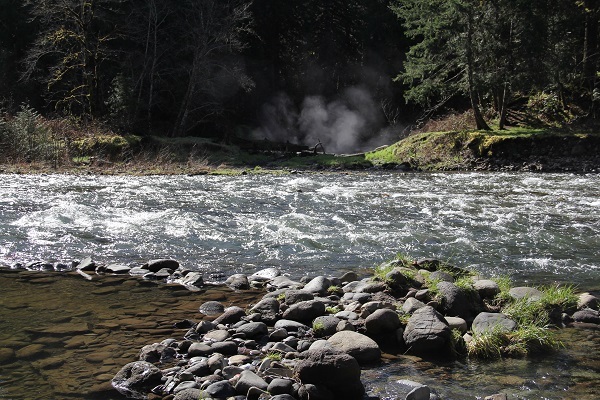 In seconds, you can leave your car, walk to the river’s edge and immerse yourself in a natural hot springs courtesy of the volcanic heat beneath the Cascade Range. It used to be just a stopping point on the highway, but now there’s a parking lot and an established trail of no more than a hundred yards or so. Keep on rolling into Oakridge, below Blue Pool Campground. Timber reigned here for many years, but the face of this town is headed more toward recreation than deforestation. Greenwaters Recreation Area is the signal you’ve arrived in Oakridge. This is the town’s unofficial ground zero of the new cycling lifestyle and the start of the Fat 55 Mountain Bike Marathon. Jacqui Lomont is one of the newer faces in Oakridge, a pioneer in her own way. 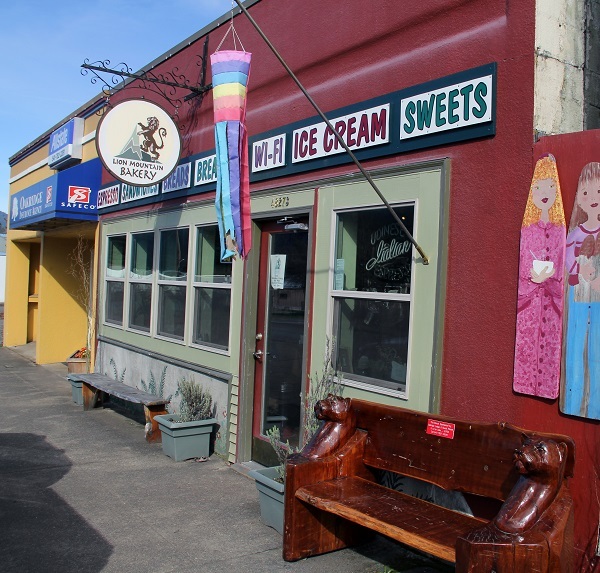 She runs Lion Mountain Bakery and plays a role in reinventing downtown Oakridge. Growing up in New York, then raising a daughter in Chicago, Lomont settled on First Street in Oakridge five years ago, “because the building felt good.” People visit her bakery from all over, including Tibet. “We’re friendly and treat them well,” she says. Back on the highway, Lowell lies west of Oakridge and to the north of the highway. 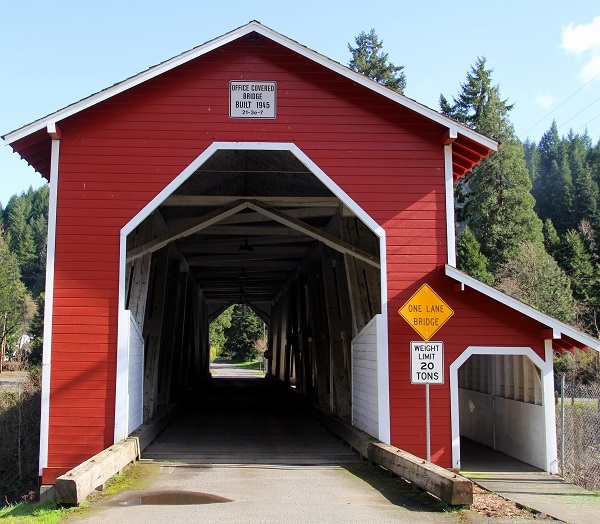 It’s home to one of Oregon’s longest covered bridge, Lowell Bridge, over the North Fork of the Middle Fork of the Willamette River. 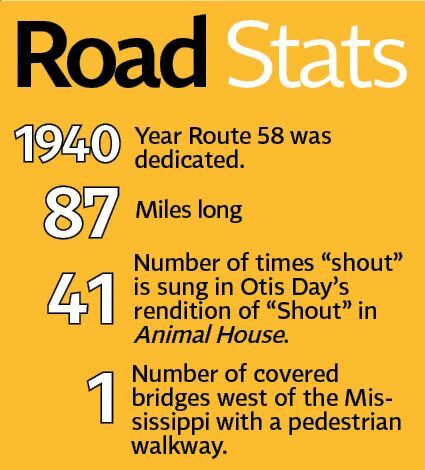 It is 180 feet long and was built in 1944 to serve the mill that used to be here. 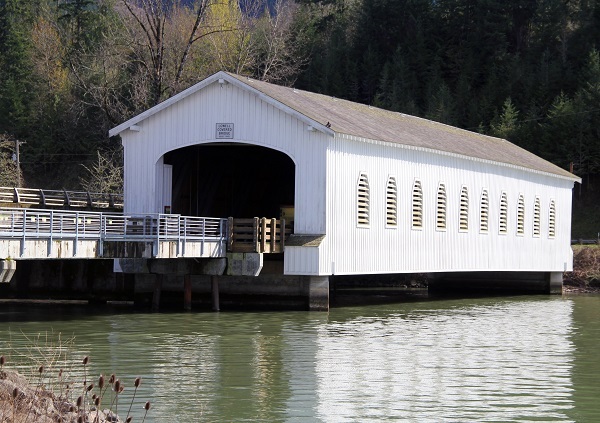 Lowell Bridge is reportedly the only covered bridge west of the Mississippi with a separate pedestrian walkway. There’s a nice park there, and it’s the jumping-off point to the trail that follows the Wild and Scenic stretch of the Willamette. Then it’s on the road again and into Dexter State Recreation Site, home of the Eugene Disc Golf Club. On any given day, you’ll find disc golfers, anglers, swimmers and birdwatchers out this way. Finally, it’s full circle as you make your way to Pleasant Hill, home of pioneer Elijah Bristow, complete with a brick historical marker made from his original homestead. Find tranquility at Shelter Cove and rustic charm at Odell Lake Resort. Fish for lake trout. No motors make this one of the most serene and pure lakes in the state. It also happens to be one of the state’s largest natural lakes. Stop for a dip just off the highway, near Oakridge. 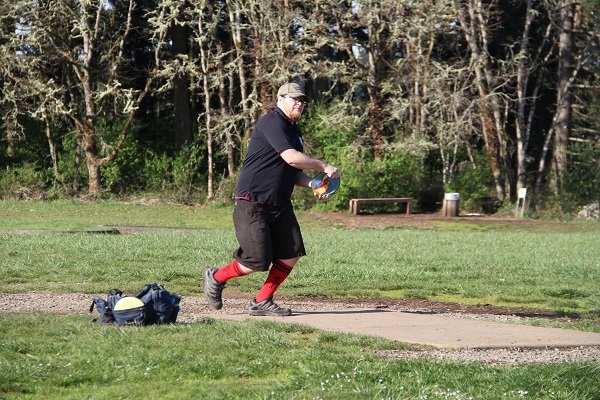 This is home to the Eugene Disc Golf Club, anglers, swimmers, birdwatchers and more. I know 1st hand of these places…grew up in Oakridge during the 70's. Have a friend that plays at the Dexter Lake Club to this day. Lots of good friends and family still live in the area. 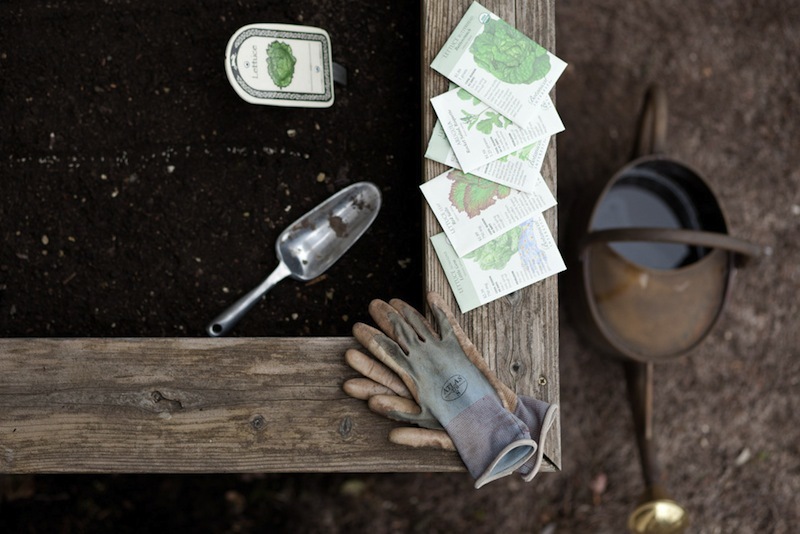 Good read/nice pics!